1. 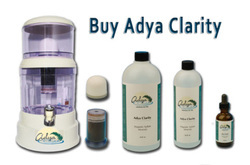 The Spa industry - spas and pools can use Adya Clarity® to treat their water thus creating real healing water, which is the real purpose of a spa. No pretreatment needed every 3-days, which is the case with chlorine. Water will stay clean for 7 months. Pools exposed to direct sunlight will need to incorporate a natural remedy to prevent algae blooms. 2. Cleaning out various water sources to turn them into safe, clean drinking water. Will reduce or remove chlorine, fluoride, anaerobic bacteria, heavy metals and some molds and fungus’. · Can be used in 3rd world countries that have contaminated water sources. · Can be used to clean sewage water, which then can be used for agriculture. · Added to irrigation waters for crops will yield stronger, more resilient, and highly nutritious crops, which will be able to sustain in extreme weather conditions. Resulting in higher crop yields. · Added to fish farming pools, will yield extremely clean water w/o the need of chemicals and medicine. Resulting in healthy, clean fish, like GOD intended them to be. Those seeking treatment for a specific disease should consult a qualified integrative physician prior to using our products if possible.